Many times when a candidate prepares to run for office, they perform a family history search to gain a better understanding their background and make sure that they do not have any embarrassing issues that may be used against them by their opponent.I have done this type of political genealogical work before. It is usually a general request to find anything of note rather than proving that the person is a direct descendant of someone in particular. As a genealogist, it always interesting to hear how often candidates invoke the actions of their ancestors on the campaign trail to justify why voters should pick them. This is why a debate in Illinois U.S. Senate between Tammy Duckworth and Mark Kirk piqued my interest. During the debate, Tammy brought up her family’s long history of military service that dates all the way back to the Revolutionary War. 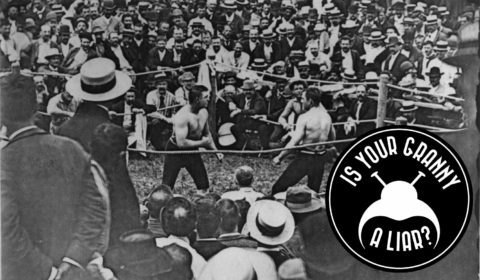 Her opponent, Mark Kirk, remarked that it was unlikely that her ancestors came from Thailand to fight in the Revolution. Although Tammy’s mother was born in Thailand, her father’s family has a long history in the United States, and many of her ancestors had served in past conflicts. Proving that people are descendants of Revolutionary War veterans is a common task in genealogy, so I decided to see whether Tammy’s claims were true. Tammy’s father was a military veteran who served in World War II, Korea, and Vietnam. According to the Social Security Application and Claims index (via Ancestry.com), he was born Franklin Garthwright Duckworth in Luke, Alleghany County, Maryland, on 9 October 1928. 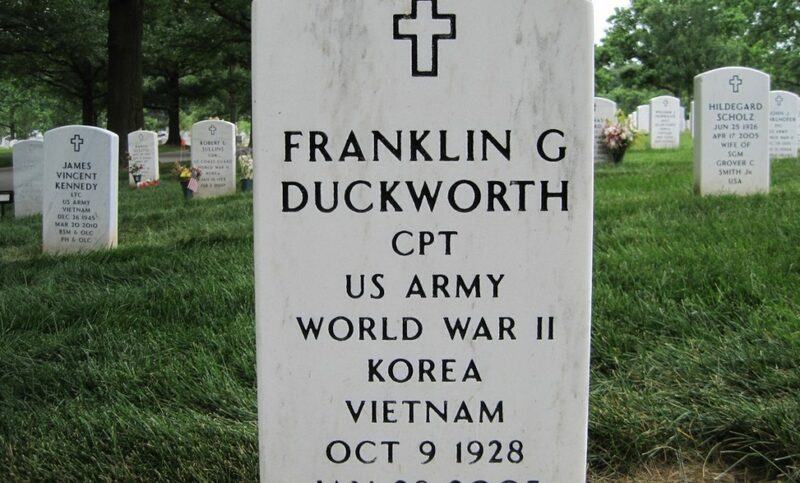 His parents were Joseph F. and Winnie D. (Smith) Duckworth. I did some quick searching, and I found that her 5th great grandfather, Jacob Duckworth, may have served in the Revolution. I then reached out to the Duckworth campaign, and they informed me that she was a member of the Daughters of the American Revolution under the patriot ancestor Elijah Anderson (Tammy’s 5th great grandfather). In my analysis that I describe below, I checked these two possible family lines using as many primary sources as I could find and other documentation to illustrate Tammy’s connection to two of her ancestors. Joseph Franklin Duckworth was born in Westernport, Alleghany County, Maryland on 22 October 1903 to his parents Philip and Eliza (Groves) Duckworth. 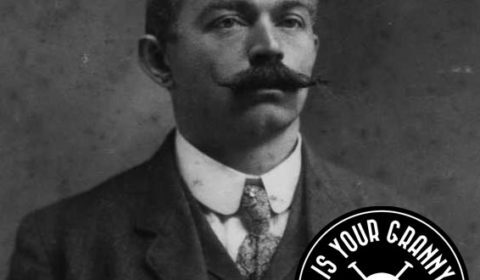 He died tragically from a motorcycle accident on 1 August 1929 in Kalamazoo, Michigan at the age of 25 (death record index entry via FamilySearch and image via Ancestry.com). His wife was Winifred “Winnie” D. Smith. According to her second marriage record (via Ancestry), Winnie was born circa 1911 in Detroit, Wayne County, Michigan to her parents G. Robert and Daisy (Amick) Smith. According to Daisey’s death record, she was born on 15 June 1878 in Virginia. Her parents were listed as Henry and Martha (Scrivener) Amick. She died on 12 February 1953 in Staunton, Augusta County, Virginia at the age of 75. Interestingly, in the 1880 Federal Census, she was living with John H. and Martha Amick, but she was listed as their grand-daughter instead of their child. She was four years old at the time, meaning she was born circa 1876. I also found an index entry in a collection of Frederick County, Virginia birth records, which shows a girl Daisy Amick was born on 13 July 1876. Her mother was listed as “Alice,” and the entry for her father’s name was just listed as “illegitimate.” John and Martha Amick did not have a daughter named Alice, but they did have a daughter named Alma who was born circa 1854 who would have been old enough to have a child in 1876 (22 years old). In fact, the 1930 Federal Census shows that Alma was living with Daisy and her husband George Grant, as well as Winnifred (Smith) Duckworth, and young Franklin Duckworth (Tammy’s father). Daisy and Alma were listed as sisters. From these records, it seems possible that Daisy was the daughter of Alma but was raised by her grandparents, and it was later presumed that they were her parents, even on her death record. Checking the original entry for Daisy birth (not a transcription) could help see if her mother’s name could be Alma instead of Alice. From the records we found, it seems like Alma is, in fact, Tammy’s 2nd great grandmother. 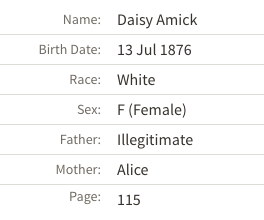 Even if Daisy is Alma’s daughter, rather than Martha, she would still be a descendant of John H. Amick (as either his daughter or granddaughter). John was born on 18 April 1826. He died on 12 April 1892 and was buried at the Bethel Church Cemetery in Gore, Frederick County, Virginia. 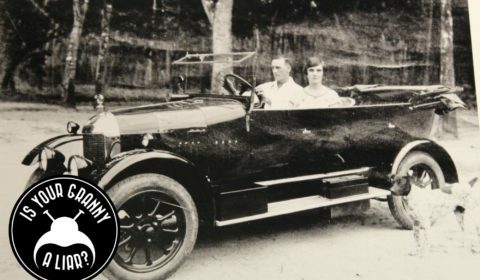 There are not a lot of primary sources available online that showing the connections between the next two generations of the Anderson family, but here is what I was able to find out. According to the DAR’s Genealogical Research System (GRS), John was the son of John Jacob and Tacy (Anderson) Amick. It’s interesting to note that the headstone for John Jacob Amick lists his given name as John Jacob, but almost all records created for him while he was living, including his War of 1812 Pension record, just list his name as Jacob. We know that Jacob’s son, John H. Amick, was born on 18 April 1826. At the time of the enumeration of the 1830 Federal Census, there were two white males under the age of five living in Jacob’s household along with one white female between the ages of 15 and 19 (possibly Tacy) and one white male between the ages of 20 and 49 (Jacob). Since John Henry Amick would have been four years old in 1830, he is likely one of the young boys enumerated in that household. Jacob Amick married Tacy Anderson on 28 April 1825 in Frederick County, Virginia. The only other reference to Tacy I did find online was this indexed marriage record for John’s brother, James, which lists his parents as Jacob and Tacy Amick. The index entry for John’s marriage did not list his parents’ names. Tacy died on 20 December 1846 in Hampshire County, Virginia (from the DAR’s database). 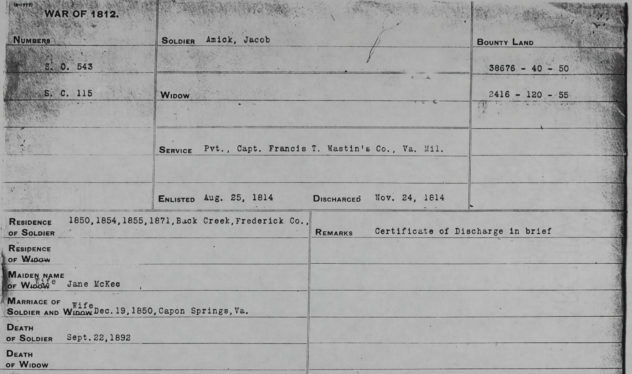 Jacob Amick served in the War of 1812, but his pension file does not list his children, and it only lists his wife who he married at the time when he first filed for a pension (Jane McKee). According to the DAR’s GRS, Tacy was the daughter of Thomas and Sarah (Anderson), Anderson. Sarah “Sally” Anderson married Thomas Anderson on 22 November 1799 in Fauquier County, Virginia. According to the website, FindAGrave, Sarah was born on 17 February 1779, and she died on 18 August 1815. 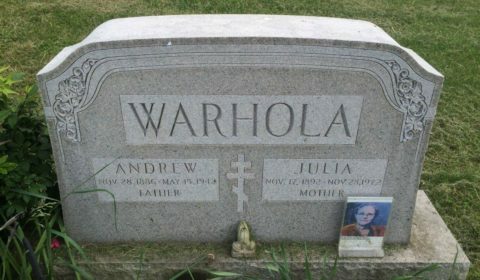 She was buried in Gore, Frederick County, Virginia. It’s important to note that there is not an image of the headstone, so the dates provided on FindAGrave may not actually be what is written on a headstone and just data that entered in by a user. Elijah Anderson was born before 1765 in Virginia. He died in 1837 or 1838 in Rappahannock County, Virginia. He was buried in Amissville, Virginia. According to Louis Alexander Burgess’ book Virginia Soldiers of 1776 (Vol. III Pgs 1247-1248). He served two months and ten days under Captain John Ball’s company of the Virginia Militia under the command of Elias Edmonds. From the limited research that I did, it was unable to find good links between the last three generations online. 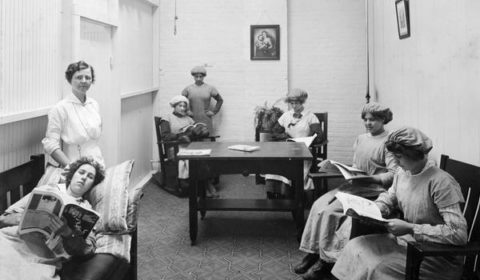 However, the Daughters of the American Revolution have high standards of documentation to prove the connections between each generation on their membership applications. It’s probable that other sources that aren’t easily available online, such as land, and probate records, or even a family Bible, could prove the relationships between each generation. And as such, it is highly likely that Tammy is a descendant of Elijah Anderson. Although it was interesting to find that her great grandmother, Daisy Amick, was probably the granddaughter of John H. and Martha (Scrivner) Amick, and not their daughter as reported on her death record and the information in the DAR’s GRS system. Philip was born on 10 April 1881. In 1900, he was living with his widowed father, Aden Duckworth, and two of his siblings in Bloomington, Garret County, Maryland. 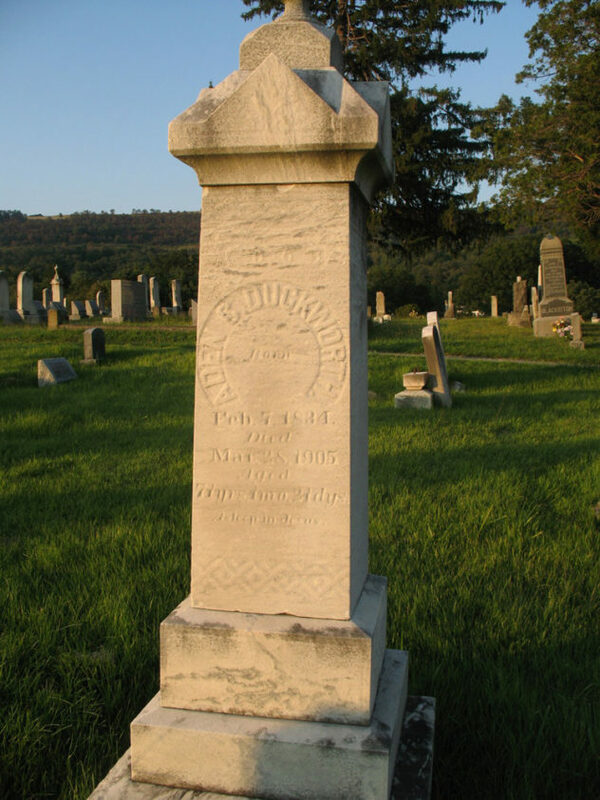 Aden C. Duckworth was born on 17 February 1834 and died in Westport, Garret County, Maryland on 28 March 1905. Interestingly, his obituary (transcribed via FindAGrave) did not list Philip as his son, but other records show that it very likely that he is Aden’s son, including the 1900 Federal Census. 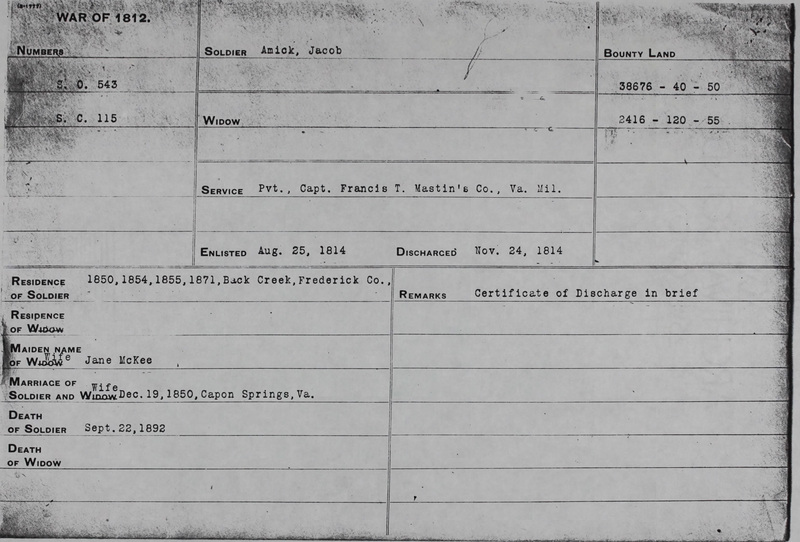 Based on the names’ of siblings listed in Aden’s obituary, he is the son of John L. and Sine (Trollinger) Duckworth. The 1850 Federal Census shows that Uriah Duckworth was born circa 1775 and he was living with his son, Uriah Junior in Allegany County, Maryland. 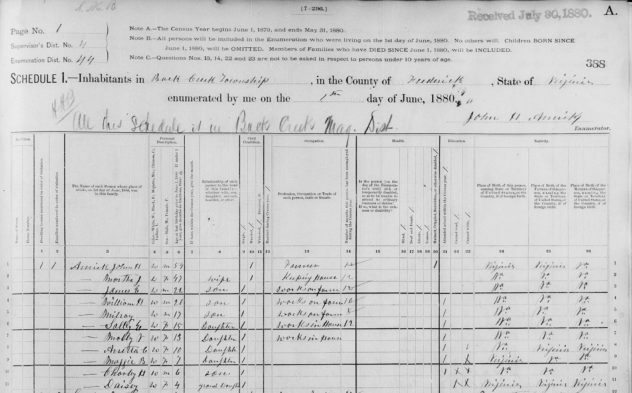 Unfortunately, the state of birth is left blank, so we cannot confirm that Uriah was born in New Jersey per the 1880 Federal Census record for his son, John. Uriah is likely the son of Aaron Duckworth, who was the first of the Duckworth family to settle in Allegany County, Maryland. The 1810 Federal Census shows that there are several households with the Duckworth surname living in close proximity to one another near George’s Creek in Allegany County. Aaron Duckworth is the only household that has a male over the age of 45. The Uriah Duckworth listed below is likely his son since he would have been between the ages of 26 and 44 in 1810. The book Duckworth and Associated Families (Marian Cowgill, 1996) states Aaron’s birthdate as 28 January 1742 and that he was the son of William and Mary (Wright) Duckworth of Burlington, New Jersey. In my search I found many secondary sources to suggest this connection, but none of them had any references to primary sources to prove this as fact. Aaron would have been old enough to serve in the Revolutionary War, and given that we know John Duckworth’s father, Uriah, was born in New Jersey, it’s possible that Aaron served in New Jersey and relocated to Maryland after the war perhaps by a Military Bounty Land Warrant. The only reference I could find to an Aaron Duckworth serving in the Revolution is the in the book Documents Relative to the Colonial History of the State of New York. An Aaron Duckworth is listed in the Roster of Troops for the Revolutionary War. He was a private in Shepherd’s Company in Hawthorn’s Regiment (Vol. 15., pg. 363). Although the Aaron was living in New Jersey, Hawthorn’s Regiment was composed of men from both New York and adjacent parts of New Jersey. 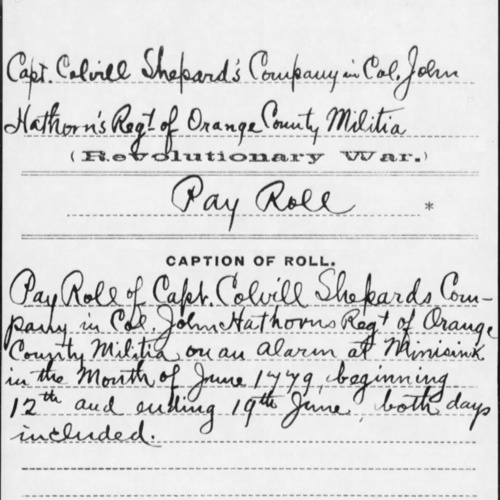 According to the above-transcribed payment card, Captain Coville Shepard was in charge of the Orange County Militia, which is located directly on the border New York and New Jersey. I next checked payment cards and other primary sources to find more evidence of Aaron’s service. I did not find any entries in the records collection of Revolutionary War Service Records. I also search a collection of lists of Revolutionary War Pensioners to see if Aaron ever attempted to draw a pension for his service, but again I did not find any records for an Aaron Duckworth. 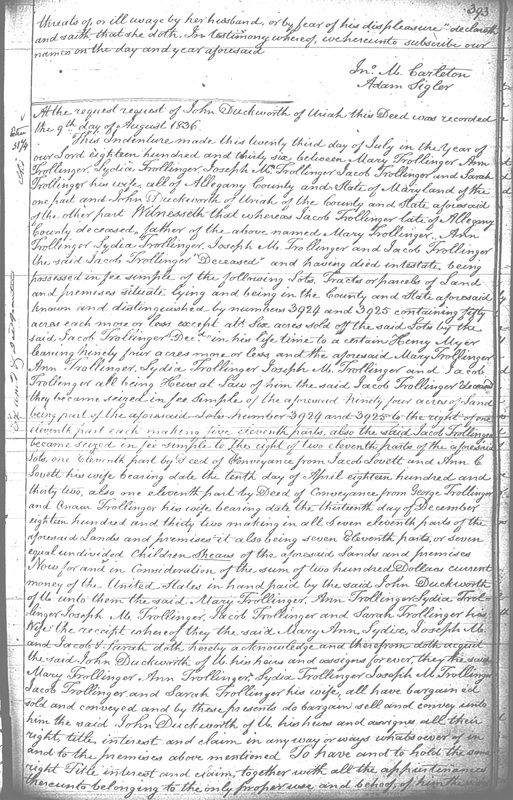 Many user-generated Ancestry.com’s family trees state that Aaron received his land in Maryland in exchange for his service during the war because it was included as part of the Francis Deakin’s survey of 1787 of the land West of Fort Cumberland in Maryland. The primary purpose of this survey was to create bounty land, which could be given to soldiers, officers, and recruiters who served in the Revolutionary War (minimum of three years service for soldiers). These lands were a part of Allegany County at the time and were later a part of both Allegany and Garret Counties in Maryland. (More information on these military lots can be found here). According to this list of settlers on these “military lots” surveyed by Francis Deakin, Aaron Duckworth purchased lots 3820 & 3821 as a settler, and not a soldier. So this doesn’t prove or disprove his military service. Finally, I focused my search on Orange County, New York because that is where Colonel Shepard’s company was based. I found in the Minutes of the Committee and of the First Commission for Detecting and Defeating Conspiracies in the State of New York December 11, 1776 – September 23, 1778, Vol. I (as published by the New York Historical Society in 1924) a reference to Aaron Duckworth. 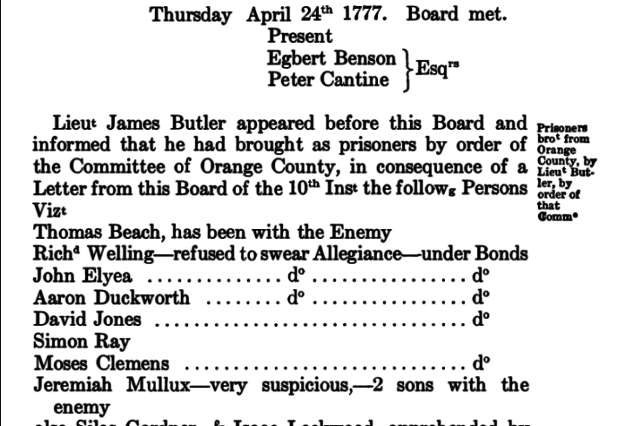 According to the book, on 24 April 1777, a lieutenant from Orange County informed the committee that he had taken prisoner several men who refused to take an oath to swear allegiance (to the State of New York). One of those men was Aaron Duckworth. He and others were released on the same day after they eventually voluntarily took an oath of allegiance. If Aaron Duckworth did serve in the Revolutionary War, he might have been a reluctant patriot since he was slow to take an oath of allegiance to the State of New York. It’s probable that this Aaron Duckworth and the one who was listed as serving in Hawthorn’s Regiment is the same person. It’s less clear that this the same Aaron Duckworth that eventually settled in Allegany County, Maryland (although we know he was from New Jersey which is adjacent to Orange County and he was about the right age). The book Documents Relative to the Colonial History of the State of New York seems to be a fairly reliable source. The preface of the book states that records were culled directly from originals held at the New York State Archives. It’s possible that the evidence proving Aaron’s service is not in any of the on-line databases that a lot of researchers rely on to prove a Revolutionary War ancestors. Furthermore, militia service was much less formal than those who were enlisted in the Continental Army. Militia members could be called on as needed, as such it’s possible that a single receipt of payment for Aaron service is buried somewhere in the New York State Archives. More intensive research at these archives could reveal more concrete primary source evidence of Aaron’s service in the Revolutionary War. From all this research it seems like Tammy’s campaign claim is true that her family has a long history of military servicer in America. We found that she is a member of the Daughters of the American Revolution under the patriot ancestor Elijah Anderson. With a little more intensive research, it could also be proven that another one of her ancestors, Aaron Duckworth, also served in a militia during the Revolutionary War. In addition to finding Revolutionary War veterans, we also found she her ancestor Jacob Amick served in the War of 1812, supporting her assertion that her ancestors have fought in every major conflict in American history. Although the general claims of service seem to be true, by looking at original primary sources it was interesting to see how some of the details were confused over time. For example, we found that her ancestor Daisy Amick was probably the granddaughter of John H. and Martha Amick and not their daughter. We also found that although Aaron Duckworth settled in an area that was surveyed to be used as military bounty land after the Revolution, he acquired that land as a settler and not in exchange for his military service. Also, we found that Aaron may have been slow to join the war effort as he at first refused to take an oath of alliance to the State of New York before he eventually joined a militia. While the real-time fact-checking of the candidates running for office by the media will end on November 8th, this type research, and search for the truth is never done for a genealogist.